It was our third day of five in Sorrento, Italy and today we planned on visiting Pompei. Awake early, we checked outside only to find, much like every other day of our stay in Sorrento, clouds threatening rain. We packed full rain gear, hoping we wouldn’t have to use them. The walk to the train station was about 15 minutes and partway there the rain started, prompting us to put on our wet weather gear and mumble under our breaths the rest of the way. We opted to take the train rather than drive. 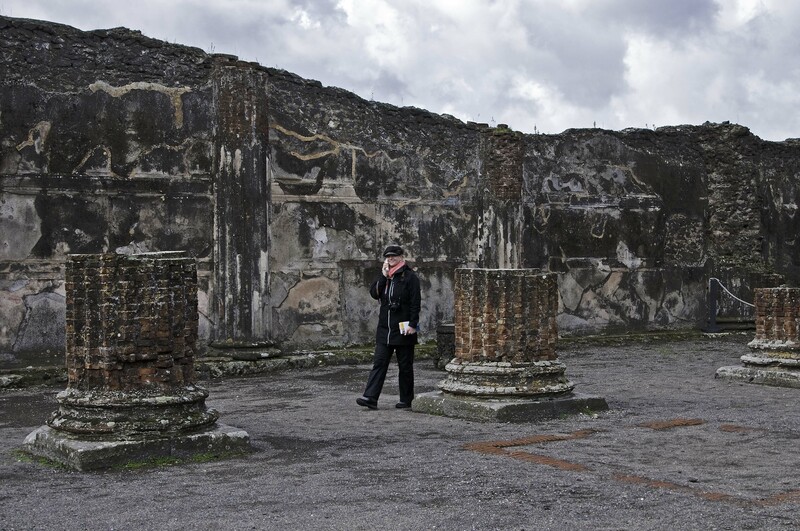 It was cheap, easy and stopped right at Pompei, so we wouldn’t have to worry about parking. We entered the little shop just outside the train station to buy tickets. “You know about the train strike?” She said from behind the counter. My wife and I looked at each other in total surprise. As we purchased the tickets relieved that the strike shouldn’t interfere with our plans, I thought the whole thing rather civilized. A strike conveniently built around our travel plans. The train stops right outside of Pompei, which to my surprise, is literally a suburb of Naples. It seemed odd, this ruined city being engulfed by a modern one, yet when you are inside, you get no sense of being close to anything. You seem to step back in time, letting your imagination rebuild the parts of the buildings no longer there. 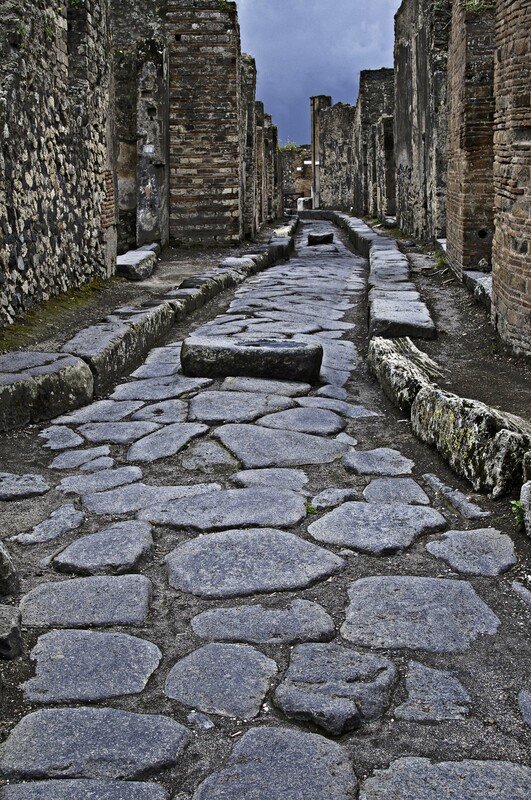 We had a good map of Pompei, but there is no route to follow to see the various sites. They are scattered around the town and a number of the roads are closed, forcing you to retrace your steps or take a different route. The well-marked names of roads on the map do not translate to the streets themselves and, much like my experience in every city in Italy, it is often hard to find the street sign. An interesting discovery was the number of restaurants or fast-food places – 87 if I recall. The homes were so small that most people didn’t cook at home; they ate out or went to a fast-food place to take food back home. 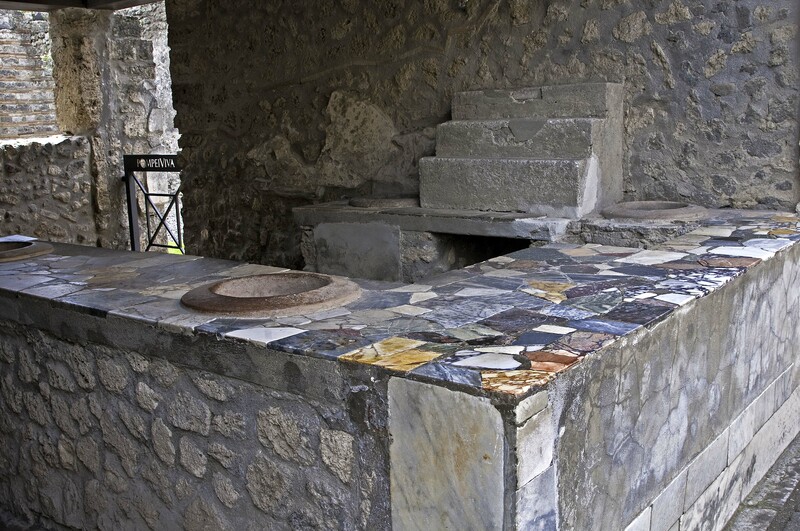 I can see how eating in Italy is as much social as nutritional when you see how they ate 2,200 years ago. Fast food, or good food fast, is not new. The roads are made with large stones and as we walked along one, it transitioned from smooth, or as smooth as stones can be, to one with ruts. Apparently they were in the middle of re-paving, so to speak. Even then the chariots wore down the road enough to require roadwork. I wonder if the citizens grumbled then as much as we do now. We found ourselves in front of the town tavern when it started to rain again. Unfortunately, it has been closed for 2,200 years, so we sought refuge in the baths. The return train ride was packed; everyone getting out before the pending strike. After being on our feet for the whole day, we had to stand on the train the entire trip back. Fortunately, I guess, it was so full you couldn’t fall even if you wanted to. In fact, it took me two stops to get my hand up to scratch my nose. 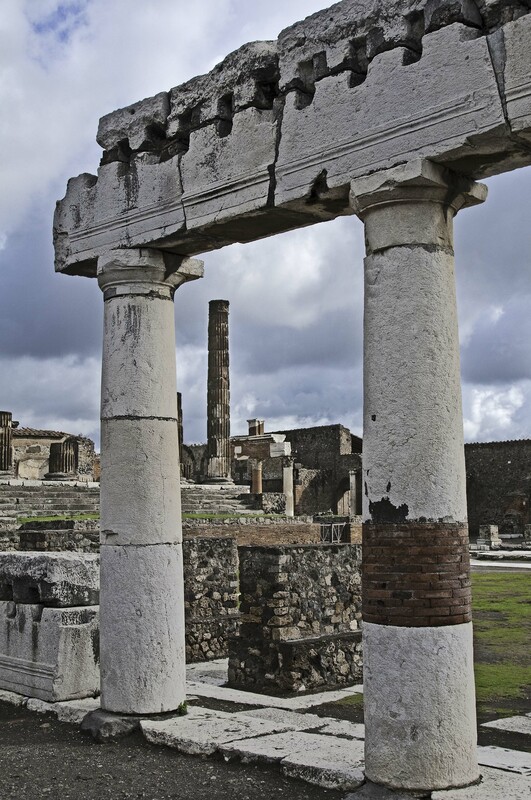 This entry was posted in Travel, Travel Photography and tagged ancient, Italy, Naples, outdoor photography, Photograph, photography, Pompei, ruins, Sorrento, travel photography. Bookmark the permalink. Nice entry. 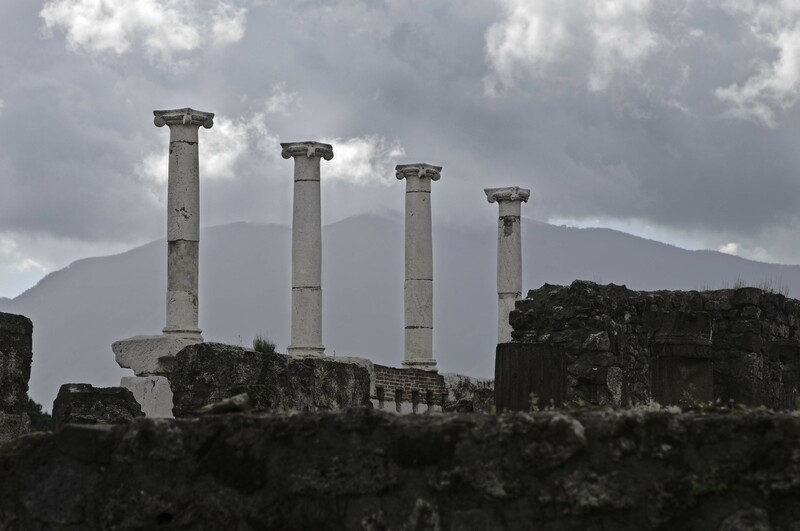 I have always wanted to visit Pompei and your description makes it sound even more interesting – different than the usual touristy babble. Thanks. It really was fascinating. 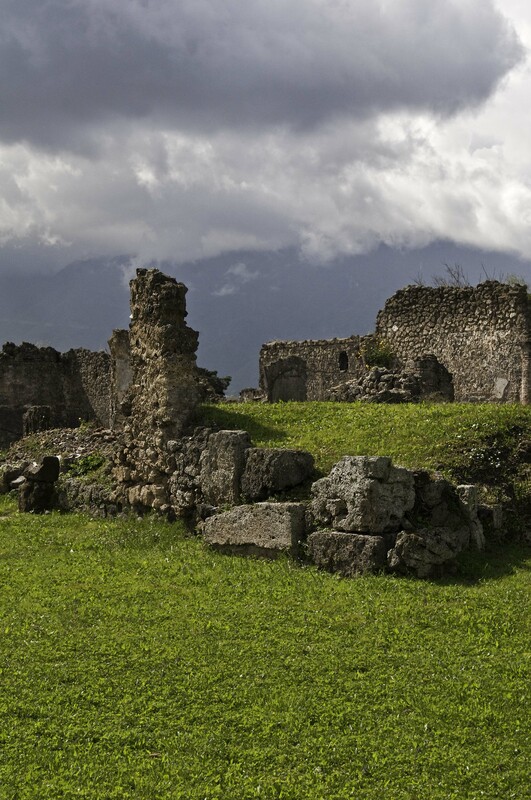 If I return to that part of Italy, I would go to Hurculaneum. It is suppose to be just as good but not quite so crowded. My favourite Roman ruins are still Ephesus in Turkey.